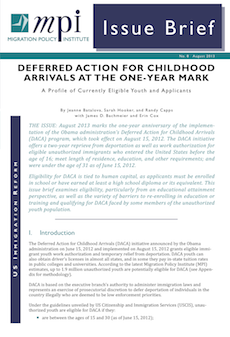 The Migration Policy Institute has just published a new policy brief, Deferred Action for Childhood Arrivals at the One-Year Mark: A Profile of Youth and Applicants, which includes MPI’s most recent estimates on the current and prospective Deferred Action for Childhood Arrivals (DACA) population, and broken down into categories, such as educational attainment, English proficiency, state of residence, country of origin, age, gender, labor force participation, poverty and parental status. MPI researchers think that about 1.9 million unauthorized immigrants are potentially eligible for the DACA program, with 1.09 million currently meeting the age, education, length of residence, and other criteria. About 392,000 of these individuals are too young to apply now but would become eligible once they reach age 15 if they stay in school or obtain a high school degree or equivalent. It’s the remaining 423,000 young people who appear to meet everything but the education requirements that are of most interest to adult education advocates. MPI’s brief includes some interesting estimates regarding the educational attainment, English proficiency, state of residence, country of origin, age, gender, labor force participation, income, and parental status for this population. Not surprisingly, these individuals tend to be poorer and less English proficient than those who appear to meet all the DACA requirements. However, more of the individuals in this subset (71%) are in the labor force.